Stills Gallery is delighted to be presenting a selection of recent works by Pat Brassington. These works initially bring to mind the vernacular photography of family photographs with their familiar patterned carpets and curtains. But Brassington's work unsettles the role of photograph as memoir. Her homely scenes are interrupted by a series of surreal and faceless interlopers. This depiction of bodies with a twist of humour and eroticism is characteristic of her work. There is a suggestion of instability - or is it unboundedness? - in images featuring three legs hovering over a tight-rope or a roller-skating figure poised in mid air. And what are we to make of the titles of these works; Wacked and Tripper? In another work Lure, the familiarity of a matronly figure in an ill-fitting dress is disrupted by the fish tail sticking out of her hand. There is something askew in this domestic sphere. Brassington's works are compelling in both their form and content. They have a beauty that exists because and in spite of what they depict. 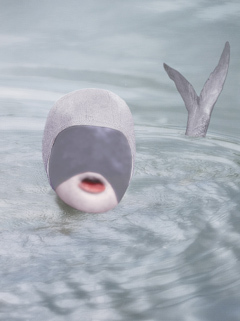 Pat Brassington is one of Australia's leading artists. She has exhibited widely both in Australia and overseas for the past 20 years. Her work was selected for inclusion in the Biennale of Sydney in 2004 and is held in many private and public collections including the Art Gallery of NSW, Queensland Art Gallery, National Gallery of Australia, Tasmanian Museum & Art Gallery, National Gallery of Victoria and Artbank. A major retrospective of her work was held at the Ian Potter Centre, University of Melbourne in August 2002 and she was included in Photographica Australis at ARCO in Madrid 2002.